It's February 28, 2014 and time once again for Facebook Friday! This week, eight lucky winners will get a fixed, blessed, and dressed Money House Blessing vigil candle. 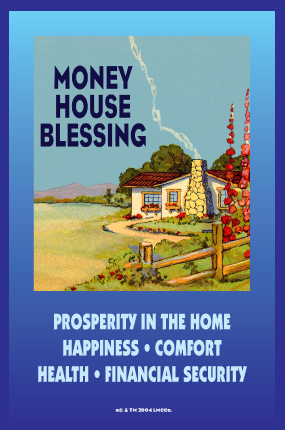 Money House Blessing is the featured product in the March Lucky Mojo Newsletter, so this week's entrants will have an early chance to check out this popular product line. Do you operate a home-based business? Need to bring more money into the house? Are you having financial difficulties? Threatened by forclosure? Late on your bills? Money House Blessing may provide you with some much needed help! All you have to do to enter is to go to the Lucky Mojo Facebook page, scroll down, and post a comment to the Facebook Fridays! status message for February 28, 2014. First thing tomorrow morning, we will select eight winners at random, announce their names here, contact them via Facebook to get their mailing addresses, and send them their FREE Money House Blessing vigil candles. We have a winner! In fact, we have eight lucky winners! Our Facebook Fridays Giveaway winners for February 28, 2014 are: Lasionica Artis, Katrink Karpetz, Adrian Herrera, Jeffrey Micah Anthony Branch, Cynthia Linville, Ashlei Yatron Yay, David Craven, and Sandra Tan. Thanks, Ernie! This giveaway attracted a LOT of new people. Your help in spreading the joy is much appreciated!